Fox has just rolled out an all new Internet TV channel for their hit animated comedy series, Family Guy. Now you can access classic clips, musical numbers, and full episodes online. 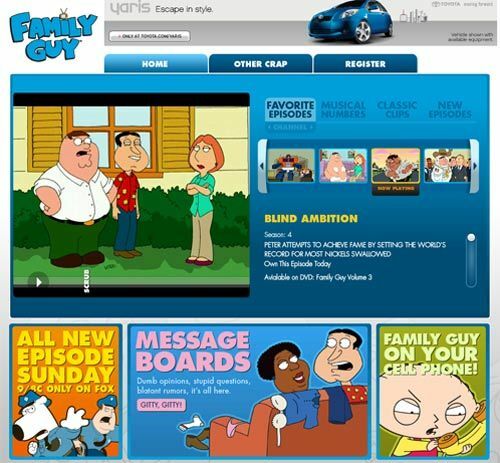 Brightcove's APIs were used to customize the look and feel of the Internet video experience, integrating the player into the official Family Guy website and giving the online community an exiting new opportunity to access the television programming. Stay tuned - lots more irreverent humor on the way. Family Guy joins a fast growing list of Internet TV channels to launch with Brightcove under the company-wide agreement with Fox Entertainment Group announced earlier this year, which include Fuel, Speed, Big10 Network, America's Most Wanted, Fox Searchlight, and FX.